Despite fierce domestic and international headwinds that have threatened to blow Myanmar’s fast-growing economy off course, executives who participated in Oxford Business Group’s latest Business Barometer: Myanmar CEO Survey remain broadly confident about the investment climate in Southeast Asia’s last great frontier market. Of the 100 respondents, 77% indicate their firm intends to make a significant capital investment in the year ahead, while 64% have positive or very positive expectations of local business conditions. The survey was conducted face-to-face in Yangon at a time when Myanmar was facing international scrutiny into the unrest in Rakhine State, as well as severe pressure on its currency stemming from the tightening of US monetary policy, moderating foreign direct investment (FDI) inflows and underperforming exports. Sentiment has shifted in somewhat contradictory ways since OBG published the results of its previous Myanmar CEO Survey in January 2018. Back then, 60% of CEOs expected their firms to make a significant investment in the next 12 months, while 70% had broadly positive expectations for business conditions. Nevertheless, the fact that sentiment has largely remained positive despite significant challenges will be seen by the National League for Democracy-led government as an endorsement of its efforts to open up the economy and stimulate private sector development. On this front, its most significant achievements since the release of our last survey include the publication of enabling rules to implement the long-awaited Mines Law and Companies Law. In particular, the latter is set to help make the country a more attractive destination for FDI and joint ventures, as it allows international investors to own up to 35% of a Myanmar firm without it being considered a foreign entity. The Myanmar Investment Commission is hopeful that the updated Companies Law will be implemented with greater efficiency and transparency than was the case previously, following the introduction of an online registration system. Optimism for economic prospects remains tempered by concerns over access to credit and skills gaps. Access to credit is a perennial problem in Myanmar: the central bank maintains strict limits for interest rates on bank deposits and borrowings, which constrains financial service providers’ capacity to price risk. Furthermore, as Myanmar remains a heavily cash-based economy, few small and medium-sized enterprises or individuals can provide the necessary credit history or meet the collateral requirements to obtain a bank loan. Some improvements have been made in recent times, including the licensing of the country’s first credit bureau in May 2018. When it finally becomes operational, this should make it easier to conduct risk assessments on personal and corporate loan applications, as well as lessen the need for large collateral commitments. However, according to our respondents, progress remains unsatisfactory: 83% describe access to credit as difficult or very difficult. On this indicator, Myanmar is the worst performer out of all surveyed ASEAN countries by some distance. In recently published surveys in the region, 61% of Thailand-based and 59% of Philippines-based CEOs described credit access in their markets as easy or very easy. Looking at the major long-term structural challenges facing Myanmar, the country continues to grapple with low labour productivity and significant skills gaps in the workforce following decades of underinvestment in education during military rule. First-time international visitors to Yangon are often enamoured with the charm, courtesy and drive of local citizens, even as they struggle to make themselves understood in basic English. 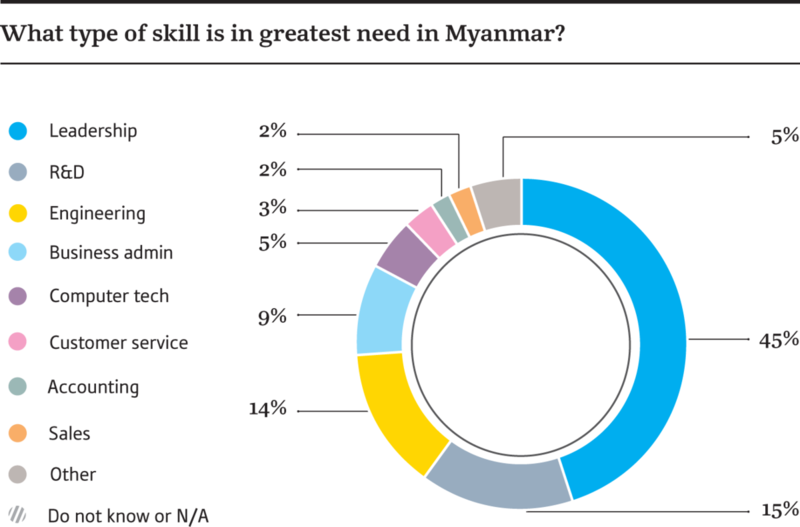 In our efforts to pinpoint the most significant gaps in the labour market from a corporate perspective, we asked CEOs to identify which skills are in greatest need. Overwhelmingly, the most popular choice is leadership, with 45% of responses, followed by research and development (15%), engineering (14%) and business administration (9%). The percentage of executives opting for leadership has increased dramatically since our previous survey, in which 30% chose this option. This perhaps suggests a growing frustration among business leaders: while the country has so many inherent strengths that can be harnessed for long-term economic development, progress is not happening as quickly as many would like, and there are concerns that momentum is being stalled by internal conflict away from the main urban centres. Delving further into growth constraints, 30% cite infrastructure gaps as the factor most likely to weigh on economic development if not properly addressed, closely followed by the bureaucratic capacity of the public sector (29%) and the capacity of the financial sector to meet the needs of the economy (22%). With an aspirational population of approximately 54m, a median age of 27, an abundance of high-value natural resources, and a strategic geographic position between the emerging superpowers of India and China, Myanmar holds vast potential to become a lucrative production base and consumer market. However, unless it finds a way to catalyse the necessary investments in human capital development and infrastructure projects, there is a risk that the country’s immense promise will remain unfulfilled.